Hello readers, in this article you will come across various reasons why Galaxy S6 can be called as an Anti-iPhone device. When we talk about the two giants, Samsung Electronics, and Apple Inc, undoubtedly we remember the lawsuits between them regarding the design of smartphones. And, they decided to end all patent lawsuits outside of the U.S. However, the legal battle will continue in the United States. Let’s hope, that ends too. The Galaxy S6 is a smartphone specifically aiming to respond to the iPhone threat. 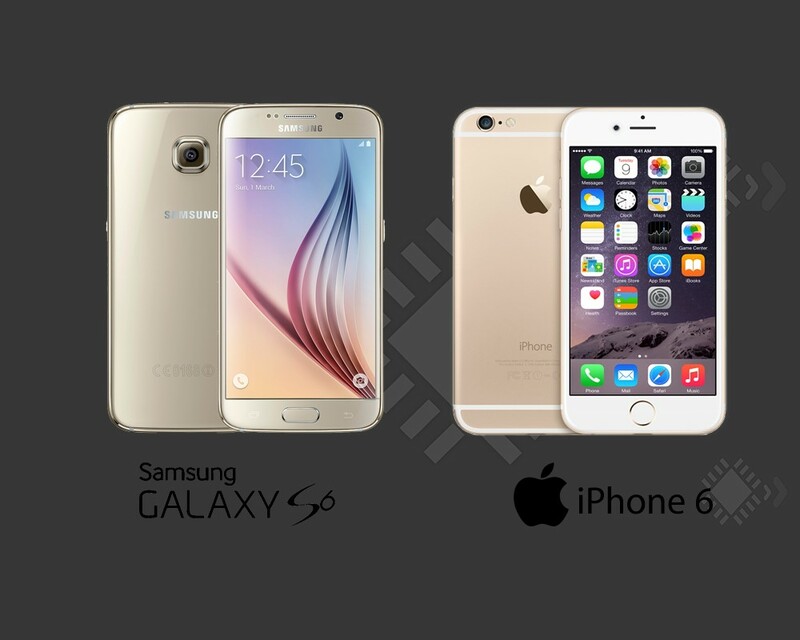 Well, recently we saw that iPhone 6 took one-third of the Android users switch to iPhone 6. But I hope, they won’t regret it. There’s no doubt about the iPhone 6 being a great phone, but Galaxy S6 is just better. Galaxy S6 can stand as an Anti-iPhone device if it beats iPhone 6 in the major aspects. Now, let’s cut to the chase, and discuss the reasons for which Galaxy S6 can be called as an iPhone Killer. Well, when it comes to the TouchWiz interface, many believe in the Android community that it can be better and faster. And, Samsung has done well making it possible on the Galaxy S6. Samsung’s heart gets loaded with Samsung Exynos 7420 Chipset (Quad-core 2.1 GHz and 1.5 GHz), GPU being Mali-T760 with 3 Gigs of RAM. The specifications offered by Samsung is a real treat for robust users, but let’s see what Apple offers in its flagship device. iPhone 6 comes loaded with the Apple A8 Chipset (Dual-core 1.4 GHz Cyclone), GPU being PowerVR GX6450 with 1 Gig of RAM. Here comes the twist. Are you in the darkness thinking PowerVR GX6450 is better? Well, that’s absolutely wrong. Mali-T760 benchmark score easily beats the PowerVR GX6450. And for the processor comparison, there’s no match to Exynos 7420 with the Apple A8, it’s really powerful and has made the Galaxy S6 smoother and faster than ever before. In a nutshell, S6 has a better processor and a better GPU. So, Galaxy S6 takes the lead in performance. Galaxy S6 sports a 16-megapixel rear camera with F1.9 lens. Well, the technology which supports this camera is an OIS(Optical Image Stabilization) autofocus, which was first seen on the LG G2. And the front camera being of 5-megapixel. It comes with an LED Flash along with 4k video recording support. iPhone 6 and 6 Plus sports an 8 MP rear camera with F2.2 lens. And here it comes with DIS(Digital Image Stabilization) technology with a dual-LED flash supporting 1080p video recording. The front camera being 1.2 MP. When you look at the specs, you get the first difference i.e an Optical Image Stabilization technology is available on the S6, which is not present in the iPhone 6. OIS technology is a great deal to make your camera shots more precise and stable. Well, it’s just not better than the DIS technology, but you could say way better than the DIS. So, you could say that iPhones are still behind running old technologies with it’s latest flagship devices. And, next comes the F1.9 lens which is a larger aperture allowing more light to come through. It is mainly responsible for better night shots. So, that also takes an edge over the iPhone. Well, it’s the new age of 4K resolution videos. Even if it is being used rarely as compared to HD(1080p) videos, still the Galaxy S6 justifies its vision, “ The Next is Now”. After iOS 8 release, Apple has been releasing big updates to take care of it’s annoying bugs. However, the icons remain same old. That’s not a good sign for an operating system, which wants to evolve as the best. So, here Android takes the lead by introducing a great many features in Android Lollipop (it also has bugs), which has been taken care on the Lollipop 5.1. Google introduced the materialistic design to the Android users. In contrast, iOS interface has very less in it to be appreciated for. In the end, it’s all the same with iOS. iOS 8 came with a whole lot of features, but unfortunately Android had it all before (excluding the trademark features). Well, it is a never ending war when comparing iOS and Android in technical aspects as both of ’em have their respective pros and cons. But in my opinion, Android environment takes the lead here. It’s way more advanced, customizable, flexible and at last Open Source with new features constantly getting added with new visions. But iOS is still the same. Moreover, iOS 8.3 is buggy with the Touch ID bug, Wifried bug (causing Wi-Fi to disconnect or fails to connect to a wireless network ). And if you have upgraded from 8.2 then there’s no way to downgrade. But still, iOS 8.2 has the same old Wifriend bug. So, I would definitely give the point here to Android over iOS, as Google has fixed everything that was wrong or buggy on the Android 5.0 and released the 5.1.1 along with more stability. There’s no major bug encountered till now. We know that the Android 5.0 comes with some bugs, but our readers say that Android 5.0 doesn’t deserve to be called as a “Bugdroid”. The Galaxy S6 features a 5.1-inch QHD flat panel screen with 2560 x 1440 pixel resolution and 577 pixels per inch (PPI) pixel density. And it’s a super AMOLED display. Whereas the iPhone 6 comes with a 4.7-inch with 1334 x 750-pixel resolution and 326 PPI. And it’s an IPS LCD display. When it comes to the display of a device, all the users usually have eyes on the PPI pixel density. It generally indicates the quality of the display. One may fail to differentiate when it differs by small figures, but it technically has a great importance. The PPI offered in the iPhone disappoints me. However, the icons are sharp in the iPhone 6. But when it comes to the Galaxy S6, it gives a richer experience. And, to match the quality, the TouchWiz interface adds the feeling being crisper. And the AMOLED display consumes less power, has greater contrast in comparison to the IPS LCD display. Well, IPS LCD display provides a sharper image. But, that’s just one advantage in iPhone 6 display. So, the Galaxy S6 display has got a better edge over the iPhone 6 display. When you loosen up your wallet to buy a flagship device, then the speakers better worth it. In my opinion, the one with a louder volume will do good. Because the quality is all the same along the flagship lines of devices excluding the exceptional HTC One (extremely good with its sound technology). So, here the Galaxy S6 is louder, whereas if you take the two phones comparing with the sound, one may ask that- Was it worth spending that much for a low volume speaker along with other disadvantages ? So, these were the basic five reasons why we consider Galaxy S6 as an iPhone “Killer”.Let us know about your thoughts on the same.